The University Nevada Las Vegas (UNLV) unveiled the newly renovated Buchanan Natatorium, the host of several major meets since 1974, and new home to the multiple championship conference teams. UNLV’s Rebel Swimming & Dive Team now has one of the premier ”all deep water” training facilities in the Mountain West Conference. With new overhead natatorium lighting designed for high end competition, two movable bulkheads, an all deep 25-yard race course, two 1-meter and two 3-meter diving boards, a 50-meter race course, an automatic timing system, and spectator seating for 1,200, the facility has been designed to host multiple large scale swim meets of the collegiate, national, and developmental level of aquatic competitions. The new pool has a depth ranging from 7 to 14 feet and is able to accommodate not only the Rebels Men’s and Women’s Swim Teams but also, P.E. classes, and the best venue in Nevada for high school state championships. 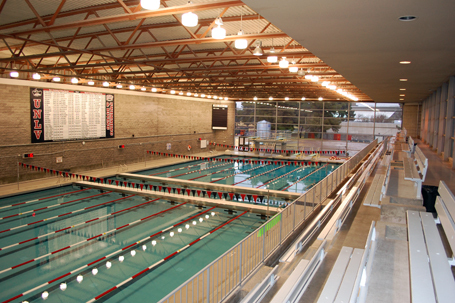 Planning for the future of UNLV’s Rebel athletic programs, the pool has been designed to accommodate the nationally growing sport of water polo. This new pool, replacing the previous aluminum shell, will allow for UNLV’s athletic programs to grow and expand and accommodate the future of Rebel sports.